Our store is located in Callac Brittany, with ample parking within 2 minutes walk. We stock a wide range good condition 'Second User' goods, including household appliances, electronic items and much much more. We accept all major Debt and Credit Cards . Sign Up NOW and Receive Full Driving Directions to our Shop! Buy and Sell are a second user store, where you can purchase new products, second hand, used merchandise, as well as some factory refurbished, electronic equipment at a fraction of the recommended retail price. We stock a hugh selection of Games, Music & DVD's. Bring in items of value & get instant cash and still have the option to repurchase your goods back at a later date. Try our Tool & Equipment Hire Service for Home & Industry, Short or Long Term Hire Available. We also offer a house clearance service, give use a call for full details. 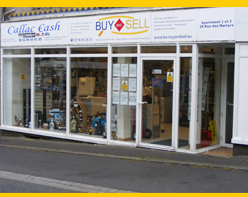 Callac Cash is our sister company, and is located within our shop. They can supply digital satellite equipment to receive French / English television and radio across Europe.